I updated my suggestion. Leaving for me better, with more action. And with more exclusion the paratroopers of commandos. Merging the Intel skills (I not like the name Intelligence reference to espionage, etc.) to make room for the paratroopers. This post has no intention of flood. Depending on a big possibility the suggestion does not change anymore. It had recently given me more inspiration. Sections can throw smoke grenades. Similar to the shock troop smoke grenade. Bren guns have been modified to fire on the move. Similar to BARs. Limited to one per squad. Second weapon slot is still available to be filled by normal brens, piats etc. Main gun modified to fire faster and perform better versus infantry. Similar weapon profile to the T70 main gun. Performance against vehicles dramatically reduced. Flanking Speed ability which increases movement speed. RAF attacks visible enemies in enemy territory. The planes do not loiter, its only one pass. 2x Anti-infantry and 1x AT plane. Enemy infantry will be pinned down and enemy tanks will have their turrets jammed if hit. The overall damage done by the airstrike will be very low: the value comes from the suppression and turret debuff. Command aura increases the movement speed of infantry by 15% and increases the accuracy of allied vehicles. The movement speed buff is not a sprint so infantry should still be able to fire while on the move. The comet itself will have the same base stats as a regular comet. 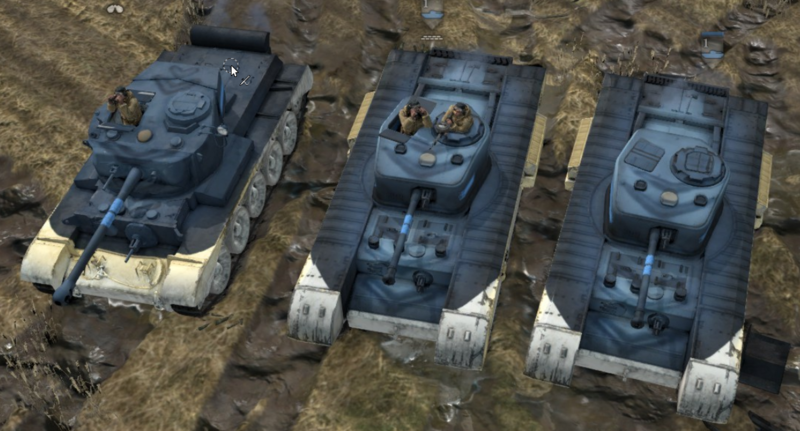 The UKF faction has many strong defensive options in the form of emplacements, section cover bonuses and tough infantry tanks such as the crocodile. The purpose of Assault Operations is to provide the UKF a more aggressive and mobile approach to combat: the abilities included in the commander are focused on rapid and effective thrusts into enemy territory. The British do not readily have access to smoke, requiring the player to heavily invest into a mortar emplacement or wait for the medium tanks and their smoke shells to arrive. Smoke Supplies should provide ample smoke, which should assist when pushing against a dug in position. The sapper smoke could be removed if the amount of smoke proves cheesy. The normal bren guns are powerful but require the infantry to stop moving to be effective, making it difficult to push against MGs. The modified bren should allow sections to remain mobile without suffering from a large DPS penalty and improving their ability to support large pushes by clearing out support weapons. The modified bren is upgradeable per squad like the Grenadier LMG. The Assault Valentine is intended to be an infantry support tool, specialising in clearing support weapons and threatening enemy infantry. The flank speed ability will assist the Assault Valentine get in canister shot range of support weapons or provide it a means of escape when the German's get angry. To solidify its role as an infantry support tank, the Assault Valentine will all but lose its ability to contest any vehicles above the super light axis vehicles (e.g. Half-tracks should keep their distance but P4s can essentially ignore it). As a result, it would also come in slightly earlier than the normal Valentine. This ability can only target visible enemies in enemy territory, making it ideal for supporting pushes into enemy territory. The other abilities in this doctrine are already quite powerful so Assault Air Support will not be as impactful as other air strike abilities in the game: the planes will not deal much damage and they will only pass over once. This should give opponents a little more room for counterplay as well. This ability is not intended to win battles by itself like cough sector assault, but will still require skill on the players part to follow up with a well coordinated push into enemy territory. Not much to say for this one. The movement speed buff should help infantry keep up with tanks during a combined arms push, as well as providing some extra benefits. 0Cp: Vehicle mounted fighting training. Infantry now can fight from inside of the univeral carrier. 4 man squad with sten gun, 2 slots. Can toss upto 2 mills bombs before cooldown. Can upgrade to 2 thompson smg, take 1 slot. Same as curent one, drop gun and reforce. This regiment, as its name, allow you to quickly answer to many situlation on the field and open more early to earli - mid game options. Mounted training help bolth UC and infantry have some better combat capable without UC upgrade which make it no more can transport troops, Also increase mobiliti of your troop. Assault section provide some close range DPS and can be a good flanking unit, fill in what UKF lacking early game. M3 provide onfield reinforce and weapond for infantry. Air resuply quickly provide AT gun for vehicle threat and also some tool for anti garrison/inderect surport. Precision barrage is for dealing with stronghold or slowed down tank. I like your ideal here, prety like my ideal about "royal tank regiment" that i postef here before. I would like to see your commens about my commander. Ok, I wrote this suggestion 2 times already and it got deleted every time, so I'm gonna write it yet again and hope that it doesn't get deleted too. This regiment values planned and agressive attacks with the tank usage. Gain vital intelligence and exploit enemy movements with the powerful and versatile british armored units. Heavy artillery can crush defensive lines of the enemy. Identical to the soviet "Radio Intercept"
This commander would focus on the tanks by making them very versatile. Radio intercept would value planning, and the APCR rounds would be a new and interesting ability. Allows comet and churchill to be upgraded with the pintle mounted Vickers MG for the 60 ammunition. Theme: This commander using the mighty British Royal Airforce for CAS (close air support) for the commonwealth frontline. By either dropping support weapons for friendly units or pushing the frontline with devastating strafes. Slot 3: Assault (4 CP): Infantry move faster and have better attack. Recon planes fly over the front lines. Slot 4: Air Resupply Operation (4 CP): Weapons and medical supplies are dropped. Better defence and reinforce speed in friendly territory. Theme: Based on real British armoured divisions like the Guards Armoured, which in general featured larger numbers of lend-leased shermans and halftracks than they did cromwell tanks. The division aims to encourage mobile armoured assaults by granting the British the versatility of the sherman and giving them an additional halftrack doctrine to provide needed mobility and aggressive frontline reinforcement capacity. Unlocks the ability to build sherman V medium tanks from the Company command post. The overall concept is to provide an aggressive armour focused British commander. The Sherman unlock provides the British player with a new option to vary up their tank force. 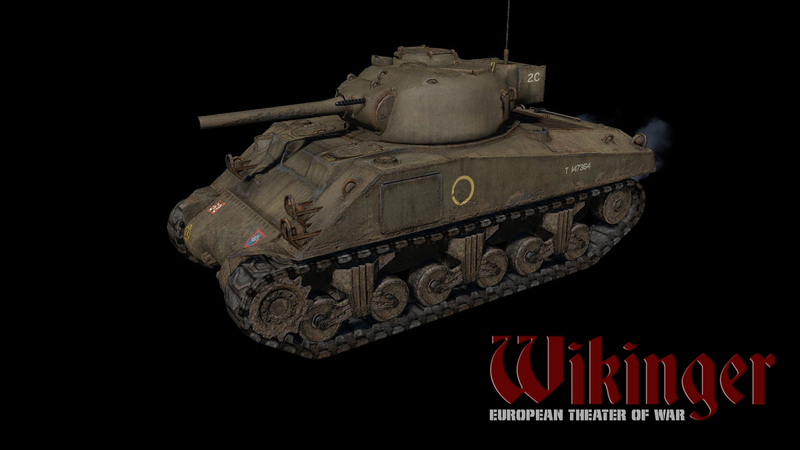 The sherman also gains additional benefits with the command vehicle aura and the capacity to use it's greater moving accuracy when given emergency war speed. The M3 supply halftrack provides a transport that infantry can provide fire support from, with the droppable vickers guns the M3 can act as a powerful assault unit for clearing enemy weapons teams and other infantry formations. The mobile reinforcement capacity allows infantry to stay in the fight longer to support the armour in longer engagements. If there is too solid a hardpoint for the mechanised force to break through the concentrated artillery should be able to either clear the obstacle or force a retreat for the followup push. Shermans and M3s were widely used by the British army during the war so it only makes sense to have a commander which gives them access to it. Theme: Take advantage of veteran British intelligence organisations to misdirect enemy forces and strike where it hurts the most. Use powerful code-breaking operations and spy rings to intercept enemy action, before delaying their logistics and mounting unexpected counter-attacks. • Intercepts enemy radio transmissions providing valuable intel on enemy actions. • Identical to the Soviet ‘Radio Intercept’ ability. • Identical to the OKW ‘Radio Silence’ ability. • Using double agents and carefully knitted spy rings, temporarily reveal all enemy units on the mini-map. • Identical to the Soviet ‘Spy Network’ ability. • Hidden resistance pockets proceed with sabotage operations, damaging and delaying the enemy logistics network. • Active for 90s, reduces enemy resource income by 15%, enemy units take 33% longer to arrive on the battlefield, enemy squads take 33% longer to reinforce. The British had arguably the best and most organised military intelligence, sabotage, code-breaking and assets of the war. 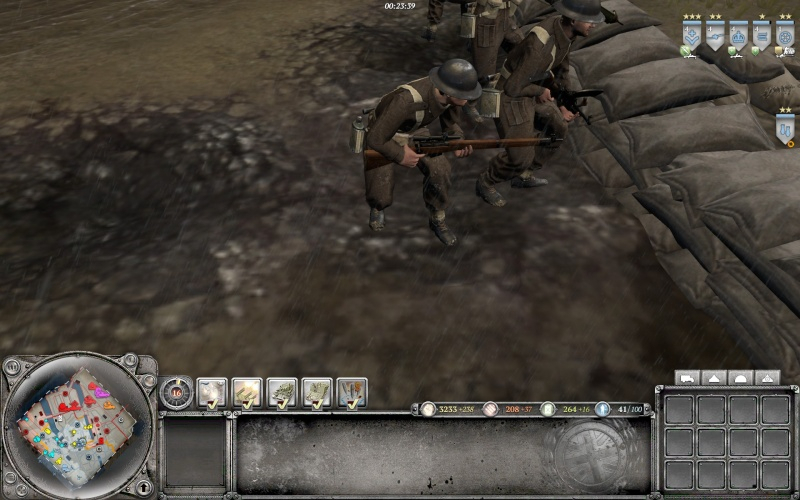 The commander aims to demonstrate that within the game by providing powerful abilities for both deception and sabotage, while keeping on top of enemy movements in order to counter them. The ‘Code-Breaking Operations’ and ‘Secret Intelligence Network’ will allow the player to anticipate what the enemy is doing, and with skill set up defences and units to counter these movements. The ‘Communications Blackout’ ability will then allow the player to quickly make unexpected counter-attacks that are difficult to react to. Combined with the ‘Sabotage Operations’ ability, a competent player will be able to hurt the enemy’s ability to recoup losses from an assault, giving them an opportune window to conduct and counter-attack. The Raid Commandos will complement the ‘Sabotage Operations’ ability by both slowing down enemy assaults and forcing them to be wary of traps within their own territory, in effect hurting their ability to react fluidly to rapidly changing battlefield conditions. The British Secret Intelligence Service and Special Operations Executive gave the British an edge in obth tactical and strategic operations by disrupting weapons development and production, as well as constantly feeding the military invaluable information regarding enemy operations. In conjunction with French and Polish resistance groups, they were also able to cause a significant amount of grief to German logistics personnel by blowing up railways and bridges, mining roads and raiding weapons stores. Part of the success of D-day can be attributed to them, by delaying German Panzer groups from counter-attacking the coasts before a strong beachhead could be established. Theme: Gather intelligence to strike your enemy where they are weakest while concealing your own units with smoke and stealth. Use command vehicle recon planes, infiltration commandos, or the Observation Detachment Valentine to gather intel on your enemy. Then use the smoke raid to close in on their positions while supporting your offensive with a command vehicle. RAF strafing support stands by to attack enemies revealed by your units and abilities. No need to alter the sexton barrage since it is disabled without sextons on the field anyway. Two Hawker Typhoons target the designated area with rockets and machine guns. UKF have a hard time approaching direct fire weapons and defensive positions due to offensive smoke being tied either to the mortar pit or a vehicle like the cromwell and the lack of an effective rocket artillery. This regiment is an attempt to always give a player an option to fight back against a player who has managed to entrench himself or to simply open up more options such as forego a mortar pit in favor of a more head-on assault. Multiple offensive smoke options (Valentine, Commandos, Smoke Raid) and multiple recon options (Command Vehicle, Commandos, Valentine Observation mode) ensure that no matter what the battle calls for they will have additional means of recon or concealment into it. The Commandos, Valentine, and Smoke Raid offer increasing levels of concealment from a single smoke grenade to inducing a literal white-out of an area. Similarly Commandos, Valentine, and Recon plane offer increasing levels of recon for better defense or a better offense. Strategies: The command vehicle + valentine combination is meant to provide a sturdy support tank or an alternative medium armour to the AEC. It provides an anvil (if used on defense) or a hammer (if used with an attacking force). Most strategies with this commander will revolve around using this combo as an effective way to buff the british army. Combining this + smoke + recon is the primary way through which this doctrine is meant to win games. To balance this strong combination there is no heavy call in nor indirect fire provided so one-shotting OKW t4, leFH, pak 43, etc. isn’t an option. This means that the player using this commander needs to employ more conventional attacks combined with the power of smoke and the command vehicle. Strafing support is strong, but it is a loiter. Command vehicle + any other ability is unique to this doctrine meaning your opponent can know strafing support is coming and prep accordingly. From a team game perspective it opens up the ability to be more mobile as the Brits as well as provide smoke via smoke raid to remote locations of the battlefield. why we don't give it to the Commando Unit ? > why we don't give it to the Commando Unit ? Scoped Enfield should be given to a sniper or recon squad. For the scoped enfield, I would suggest using it as part of a command section. 3 man team that can follow around an infantry section and buff it, giving the 2 squads the same strength as 2 regular infantry sections, but at a lower price. It doesn't promote blobbing since it's not an aura, and it forces them to be used together. The command section could snipe like the CoH1 recon section.